Rather than seeing tech as a silver bullet, it's about pairing technologists and engineers with people on the frontlines of science, education and criminal justice reform. 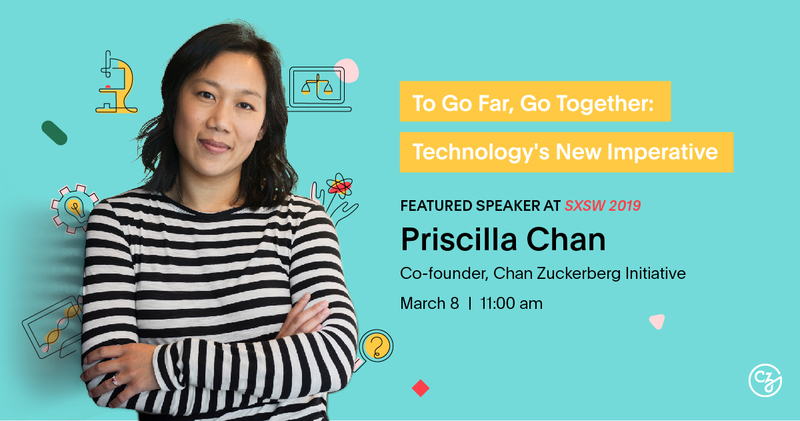 Today, Chan Zuckerberg Initiative (CZI) Co-Founder Priscilla Chan took the SXSW Main Stage to discuss CZI’s vision and make the case for why technology alone cannot solve the world’s most pressing challenges. Rather than seeing tech as a silver bullet, it’s about pairing technologists and engineers with people on the frontlines of science, education and criminal justice reform – like scientists focusing on disease prevention, prosecutors working to make the criminal justice system more fair, and teachers struggling to meet the unique needs of every student. In the US, we’re the last generation to feel nostalgia for the noise the internet makes when it is working hard. (Anybody else grow up in a Prodigy family? Yup, that’s right. The budget dial-up). We’re the last generation to wait for a copy of a DVD to become available. We’re the last generation to know a world before two-day shipping. But, the whole world hasn’t been upgraded that way, and in fact – some of our biggest challenges have not really benefited yet from technology. For many of us technology has always been synonymous with possibility, but it shouldn’t be just with the simple stuff. At the Chan Zuckerberg Initiative – our mission is to help harness technology to help solve some of our biggest challenges in education, science, and criminal justice reform. Technology is not a silver bullet, but it should be a tool. But if you came here today to hear a bunch of hype about how tech is a magic wand we can wave to solve any problem, then you might as well head out now. What I’m going to talk about is a lot harder. But I think ultimately, a lot more meaningful. How to plan your most efficient commute; How to get your favorite pad thai from across town to your door in thirty minutes, moving nothing but your fingertips; but for more complex stuff, even a engineering genius isn’t going to figure out a solution on their own. They can’t. It’s going to take teams of very different people, working together. Why? Because our country’s biggest challenges have become so complex that people dedicate their entire careers to learning about one aspect of housing policy or criminal justice reform, in order to fully understand the issue and map out potential solutions. At the same time, the latest technologies are so advanced that others have to spend their whole careers learning about them to build the knowledge they need to develop new tools. 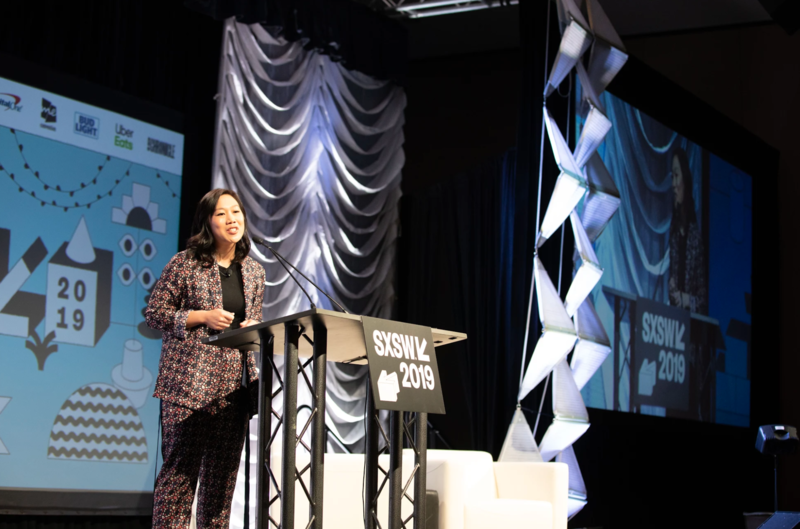 But when the people who really understand our toughest problems – the people on the front lines of education reform or disease management – don’t actually meet up with the people who could bring technology to bear to help solve some of these issues, we ALL miss out. At CZI, we believe that the only way technology has a shot at solving these problems is if we bring these people together. I’m not talking about the occasional idea-sharing meeting. I’m talking about radical collaboration — spending day after day learning from one another, debating together, brainstorming over lunch and to be totally honest, feeling tension when we see the world differently. That tension is the potential energy represents the power of what CAN BE. So that’s what we do. We bring together engineers, scientists, teachers, policy experts, and advocates. And we put their minds to work on three areas we think will most determine our country’s future: education, science, and justice and opportunity. We’re working on a myriad of issues within those three areas – from criminal justice and immigration reform, to acceleration of scientific discovery to cure and prevent disease, to providing more tailored learning experiences for students in the classroom. We want people who fully understand these issues to have the best of technology at their disposal. And we want the people developing advanced technologies to fully grasp the complexity of the issues we’re trying to solve. It is not simple or easy (try, for instance, explaining to an engineer that a product life cycle in education is an entire year!) But we believe that this approach can work. Today, I’m going to tell you three stories that show you how. The first one is about our work in education. Long before I started CZI, I had another job: teaching elementary schoolers at a school in San Jose. In my fourth-grade science classroom, there was one kid who was really bright — way ahead of his class. He was also a little bit hyperactive. In every way, he moved FAST. It was hard to teach him the material at his pace when I had a whole class to teach. But I’d also watch him getting bored, or disengaged, or acting up. So eventually, I had to ask him to stand up, or even run around the classroom just to get rid of that energy. The truth was, making sure he met his full potential would mean leaving the rest of the class behind. So, too often, my goal was just to keep him safe and contained — and, quite frankly, distracted. I was always asking: how do I meet all of my students where they’re at? Are there resources that would help? I would have taken anything. Any tool that would help me give them more of the individual attention they deserve – I wanted to try it. I couldn’t stop thinking about this boy when I first heard about Summit Public Schools, which is now a CZI core partner. Every student at these schools has access to something called the Summit Learning Platform. There, they can see the curriculum for the whole year, laid out in front of them. And they can take advantage of resources that cater to different learning styles — texts for kids who love reading, lectures for auditory learners, videos for students who need to see a concept in action. As a teacher, at first, I was a little wary of this approach. If teaching meant supervising a class while they all stared at a screen, I wouldn’t in a million years have wanted to do it. After all, the deepest learning for my students came in moments of real connection with them. But fortunately, Summit offers a lot more than screens. The program allows students to set and track their own goals (just like in the real world). It lets them learn at their own pace. And, importantly, it empowers teachers with the information they need to build stronger relationships with students – and helps them meet each individual kid where they are. A Summit teacher can see – in real time – when someone is falling behind, when they need a little bit more help — or when their interest is sparked because they just love a certain subject or science experiment. Not only can teachers track student progress and subject mastery in real-time through the platform, students meet regularly with mentors – teachers and educators who are partnered with each student, so that each kid has an advocate. With teachers and engineers working together, the early results from many Summit schools are incredibly promising. The program is still young – and to be sure, there is much for engineers and teachers working together on it to learn and improve upon. But I can’t wait to see it grow and develop —and to see the kids who grow up with it. Another of our goals at CZI is to help accelerate scientific discovery in order to cure, prevent, and manage all disease by the end of this century. Ambitious? Yes. But just think: penicillin was discovered in 1928. Its impact on medicine over the past 90 years shows just how much change is possible. That said, just as in our Education work, we believe our ability to accelerate progress in science will require radical collaboration between engineers, medical professionals, scientists, and patients too. And that surprises some people, given that we often mention science and technology in the same breath. Once I left teaching, I went to medical school and became a primary care doctor. By this point technology was a big part of my life, so when I got to the hospital, I was a little surprised to find just how many systems and pieces of paper I had in hand to help me remember the most basic of things. Things like: When is this kid’s birthday? Have they had their latest vaccines? Do they have any allergies? Anyone who has had to fill out the same form every time they get a checkup knows just how true this is. It’s a little scary. Information is not easily accessible. It definitely isn’t easily searchable or sortable. It’s not just doctors who sometimes have to sort information in a way that’s surprisingly analog. Researchers do, too. Thousands of biomedical papers are published every single day. These papers chart the progress of important ideas and discoveries across every major field of knowledge. They represent our collective knowledge about the mechanisms of how life works, how we got here, and where we’re going. Yet, for a researcher, looking at the history of research on a topic and trying to keep up to date with new developments is a tedious, time-intensive, hugely imperfect process. At the same time, you might have Spotify open on your computer sorting through an enormous amount of music to learn exactly what you like, and deliver new and relevant songs. But when it comes to identifying a body of research that might lead to a new breakthrough, you are completely on your own. Meanwhile, personal connections between people working on the same problem are often made by word of mouth — or, more often, not at all. As one of my colleagues put it: “Nobody knows what is happening in science.” That is holding back key research. And that holds back anyone who might benefit from that research. Which is, well…everyone. One of our early projects at CZI was called Meta, an idea dreamed up by a brother and sister named Sam and Amy Molyneux. Sam is a medical biophysicist. Amy is a software developer. 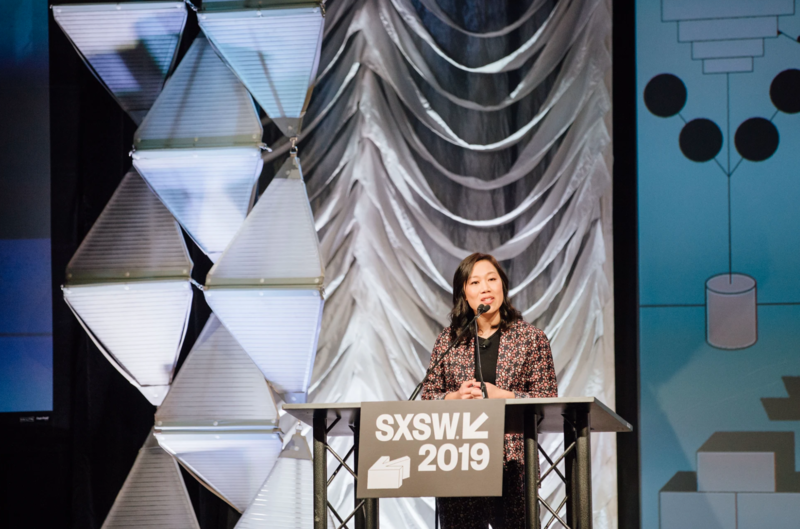 Together, they created a tool that uses artificial intelligence to organize and track millions of biomedical research papers, identifying the ones most relevant to a researcher’s current work, and delivering them through personalized feeds—like a Spotify for science. It updates in real time as new papers are published, so researchers know exactly what is happening in their areas of focus. Another scientist, a cancer researcher, was searching for ways to kill tumors and discovered a promising lead: something called replication stress. She didn’t have the technical expertise to conduct experiments on it, but through Meta, she was able to quickly find researchers who did – some who were actually very close by. Their labs are now collaborating on a paper, each conducting the aspects of the experiments they’re best suited to handle. They’re planning to meet up so they can learn new techniques from one another. That kind of meeting of the minds is how breakthroughs happen. The last story I want to tell is about the criminal justice system, and how it failed an incredible woman named Ingrid Archie. Growing up, Ingrid’s mom was abusive. But because her dad had marijuana charges on his record, he wasn’t allowed to take custody. Instead, she wound up in a group home, where, as a teenager, the other residents got her selling drugs, stealing, and hanging out with gang members. It was an environment of survival, and of desperation. Eventually, Ingrid went to prison — which meant leaving a baby daughter behind. Being separated from her baby changed everything. She promised herself: she wasn’t going to let her daughter get caught up in that same cycle. Once she served her time, she went to a safe house that helped her build a new future. She started caring for her daughter, going to college, working two jobs. But as she tried to get on her feet, the system pushed her right back down. After three years of doing good work for her employer, they changed their policy: they would no longer hire people with felony convictions. She was immediately fired. One day, she stopped at the grocery store to buy milk and diapers. She ran into the store for five minutes, one kid in her arm, the other in the car. She came back to find police officers standing outside, waiting to charge her with child endangerment – for leaving her child in the car. She spent three years in prison, losing custody of her kids once again. During that time, while her oldest daughter was in foster care, she was sexually assaulted. And with that the legacy of trauma was passed down again to a new generation. Ingrid’s story breaks my heart. And the worst part is, it’s not uncommon. One in two Americans has an immediate family member who’s been incarcerated. Think about that. 1 in 2. When I was a pediatrician at San Francisco’s safety net hospital, I saw the impact of incarceration on my patients almost every day – kids suffering trauma from being separated from their parents – over and over again. Getting convicted of a crime – just once – pins you with a scarlet letter that doesn’t just get in the way of your future – it gets in the way of your family’s future too. It holds back generations. Painfully, the decisions being made about people like Ingrid in the criminal justice system are often random and more punitive than they need to be. The prosecutors we work with at CZI tell us that they rarely have the information to consider the full context of the situation when deciding what to charge. They’re forced to make these decisions after looking briefly at a police report, with little to go off of beside their gut. And, because the primary measure of success of prosecutors is conviction rate, there is very little incentive to pursue anything other than the highest charges. At times, technology has made the criminal justice system more efficient, but rarely has it made it more just. Think about the technologies you know are being used in the criminal justice system today: Improved surveillance technologies. New ways to track people with criminal records. But when you talk to people who are experts on criminal justice – people who have been through the system, or work within it every single day – here’s what they tell you: When the system isn’t fair – making it more efficient just makes it even better at being unfair. The question now is not how technology can fix all these issues at once – as I said before, it’s not a silver bullet. Tools need to be developed with equity in mind – not efficiency. With redemption and safety in mind – not punishment. Technology could have made a difference in a story like Ingrid’s. How? So many decision-makers within the system only get to see the moments when people have been convicted of a crime – not the way people’s lives change afterwards, and not the ways the system can trap them in a downward spiral that they can’t escape. But what if the prosecutor knew, when they were deciding whether to charge Ingrid, what had happened in cases similar to hers? Are their children better off? Are their communities safer? Prosecutors tell us that when they can see the long-term impact of their everyday charging decisions, they can make better decisions in the future. That’s why we’re working with prosecutors like Larry Krasner, the District Attorney aiming to reform the criminal justice system in Philadelphia, to figure out how we can create tools that help them make more informed decisions. We’re also supporting an organization called Measures for Justice, which has created an online tool to compare how criminal cases are handled in different counties. The criminal justice system doesn’t need to be just about punishment. It can provide a pathway to redemption and healing and growth. I really believe that. Let me tell you where Ingrid is now. When she was in prison the second time, she learned that a ballot measure, Prop 47, had recently passed in her home state of California, helping people reclassify certain nonviolent crimes from felonies to misdemeanors. She studied up on the law and got her own sentence reduced, so she could get out of prison and go back to her kids. And now, she is working to make sure other people have the same chance. At a re-entry program called A New Way of Life, Ingrid now helps women better navigate the justice system and opportunities like the ballot measure that helped her. She talks to them about how these cycles of trauma begin, and what they can do to end them. She helps them get their kids back. And she’s there for them. Last month, I visited a program called the Last Mile, which offers coding training for those serving time in prison. To give you an idea of just how great this program has been at creating opportunity for people: The national recidivism rate after five years is 79 percent. For Last Mile Graduates, it’s zero. And I’m thrilled to say that one of its graduates, Aly Tamboura, is now on our team at CZI. We recently helped the program expand to its first women’s prison in Oklahoma. I got the chance to meet with some of the women who were starting the program a few weeks ago. Nearly all of them were Moms. As I spoke with them, I imagined how their family’s lives might change when they’d learned skills that can lead to stable, lucrative jobs. And I imagined how the tech world might change, too – how it would include more diverse perspectives…more people who understand both the technology and the problem. Because their stories are proof of the power in that. The challenges we face in all these areas aren’t simple — and they won’t be solved overnight or in a silo. The work we’ve set out to do is hard. It will take time. But it’s worth it. Sometimes I joke that CZI is like the UN. We’re all speaking different languages. Often without translators. Discussions can get complicated. But I am invigorated by our work — and so hopeful, because I already see it making a difference in people’s lives. The fourth grader who might have been left behind, getting the chance to live up to his or her true potential. The researcher who is struggling to break through, getting the chance to meet a scientist who holds a piece of the answer. A woman whose family has been trapped for generations in a cycle of trauma, getting the chance, at long last, to break free. Technology has made us more powerful than ever before. It’s up to us, now, to decide how we will use that power. Will we continue to go it alone … or come together to conquer the hard stuff? The stuff that really changes people’s lives. I have seen with my own eyes that when people with divergent experiences and worldviews come together, they can create solutions more powerful than you could ever imagine.